This couple maybe breaking up soon! Good morning and welcome to Noontime Sports on October 29, 2010! It is friday, which means that the weekend is here. Have a great weekend, as well as Happy Halloween too! * The San Francisco Giants are two games away from winning their first World Series in the Bay Area. * Former San Francisco Giant, Barry Bonds, wants to be the hitting coaching. * Dwight Howard of the Orlando Magic is now producing music for young children. * Apparently Albert Haynesworth is simply happy to not be starting for the Washington Redskins. * Yet again, the NFL will have a few teams that won’t be able to have their home games broadcasted locally. The Detroit Lions and San Diego Chargers are blacked out this weekend. * The Duke Blue Devils are ranked first overall in the AP poll for college basketball. * Take a look at Peter King‘s NFL week 8 picks and see if he chose your team to win this weekend. 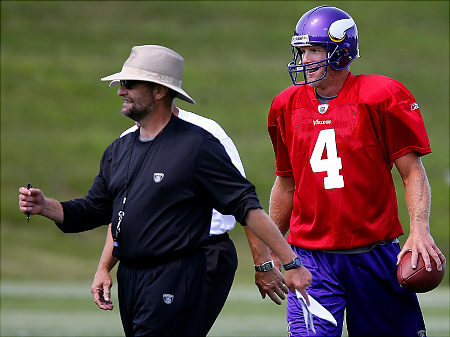 * Minnesota Vikings head coach Brad Childress seems likely to hold Brett Favre out for Sunday’s game against the New England Patriots. Enjoy this interesting CBS talk show regarding Brett Favre and his text messages.